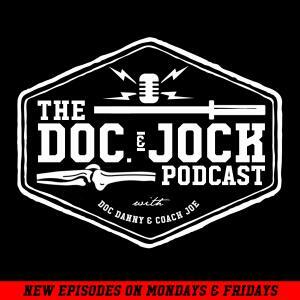 On episode 212 of the Doc and Jock Podcast we sit down with the doctor of storytelling Andy Galpin to learn how to coach with empathy. Dr. Andy Galpin is a tenured Professor in the Center for Sport Performance at CSU Fullerton. He was born and raised in beautiful Rochester, WA. In addition to being one of the world's leading muscle physiologist he also co-founded the Barbell Shrugged podcast with his buddies Doug Larson, Mike Bledsoe & Chris Moore (RIP). On Episode Andy talks about understanding how to coach with empathy. Empathy is defined as "the ability to understand and share the feelings of another," often times in the world of strength & conditioning coaches judge other coaches methods and tactics without any context to understand the method or drill. Andy's recommendation is to think of 3 instances where the seemingly "wrong" action could be right. Typically if you do that you'll end up realizing that most of the time they aren't wrong. After the education on empathy we get into a discussion on Andy's new book Unplugged which aims to teach us how to evolve from technology to upgrade your fitness, performance & consciousness.